It’s notable that the Mercedes-Benz Concept EQA uses a large, color display screen in place of the grille, because that makes it easy to remove or change the big Mercedes tri-star badge and replace it with, say, any other company’s badge. If that happened, you’d never notice because this concept car, while sleek and nicely designed, is also about as generic as a modern concept car can get. 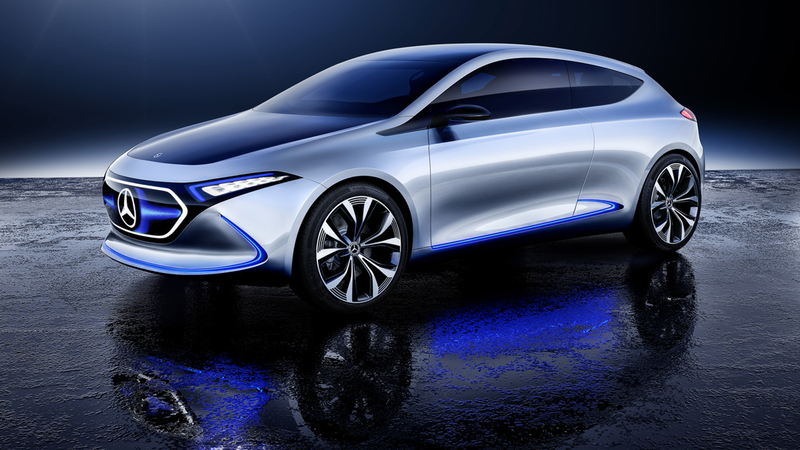 Mercedes’ press release says that “The Concept EQA is Mercedes-Benz’s first all-electric EQ concept vehicle in the compact segment,” which means that Mercedes-Benz’ planned all-electric EQ sub-brand will include a compact car. That’s not really shocking. The EQA concept is a two-door hatch design, and has a silhouette roughly the same as a modern SEAT Ibiza or any number of other somewhat sporty hatchbacks. That’s not a dig, it’s a practical shape. So, you know how you always dreamed of a car where passers-by could tell, at a glance, what driving mode you were in from the outside? Well, buddy, that dream is now realized! Maybe Mercedes will have the grillescreen display the temperature you set the A/C to, what music or podcast you’re playing, and how many miles to empty you have to go. Best to keep everyone in the loop, right? I’m being kind of a jerk; there absolutely is something cool about being able to change the look of a panel like that, don’t get me wrong. I’d be all for allowing owners to upload their own grille designs and images and GIFs or whatever. It could be fun! Ewwwwww. That name brings to mind a whole spectrum of unsettling things, from creepy ‘purity ring’ ceremonies to images of thong-clad car designers sensually designing sensuality into a sensual clay model of a car by sensually rubbing their sensually oiled sensual designer bodies all over the sensual car. The Concept EQA has one electric motor at the front axle and one at the rear. The total output is over 200 kW and maximum torque is over 368 lb-ft. The electric athlete sprints from zero to 60 mph in around 5 seconds. The impressive driving dynamics and ride safety come courtesy of the electric all-wheel drive system with axle-variable torque distribution and the battery installed deep in the vehicle floor between the axles. Of course, this is a concept, so there’s no proof anything like that is actually in the car. Still, it all sounds hypothetically good, as does the alleged/guessed/made-up range of 400 km/248 miles, which should be pretty plausible. Look, this feels like a pretty phoned-in concept from Mercedes. It’s fine, the lighting at least has some novel ideas, using laser fibers, and some interesting illuminated graphic work on the car. The good part about a relatively tame concept car design is that it could be a more accurate look at what a production vehicle may be; with that in mind, this starts to make a bit more sense. I don’t think the novel lighting or the grillescreen thing will make it to production, but the fundamental idea of a fairly sporty all-electric hatch with decent power and range is, of course, a no-brainer. As long as no one says “sensual purity” anymore.